DIRECTIONS: preheat oven to 425ºF on roast setting. If using regular carrots, wash, peel, and chop. Toss carrots with 1-1/2 tablespoons of the oil and transfer to parchment lined glass baking dish. Slice onion and peel garlic, coat with remaining oil, and set aside. Roast carrots in the oven about 10-15 minutes, then turn the carrots over and add the onions and garlic to one side. Roast another 10-15 minutes, turning the onions and garlic over, once during roasting. Remove roasted vegetables from oven and cool completely, NOTE: onions and garlic may roast faster than the carrots. If so, remove when done. 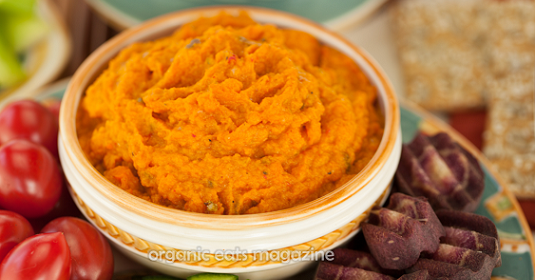 Add roasted vegetables to a food processor with all other ingredients except for chili flakes. Process the dip, adding more coconut milk, if dip is too thick. 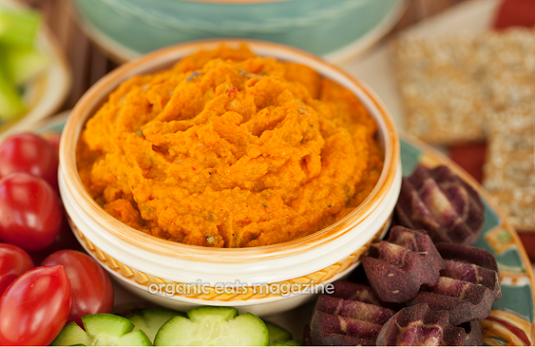 If using red pepper flakes, mix into the dip or use as garnish on top of the dip. Put dip in serving dish and serve with fresh vegetable tray or crackers. EDITOR’S NOTE: this dip is also good as a spread on wraps or collard green wraps.